Fun and Games - Dog owners who regularly play with their GSD develop a better understanding of, communication with, and respect for, their dog. Games and other kinds of dog training allow you and your German Shepherd a chance to blow off steam and have a little bit of fun time together in an otherwise boring day. Playing games of any kind with your German Shepherd is really good for your relationship. Remember, first of all, dogs are social creatures and playing is one important element in developing and maintaining their social relationships. Playing games is a fundamental way of "modeling" real life behaviors. You originally got your GSD for companionship didn't you - isn't playing with your dog and playing fun and games with him one of the main reasons for getting him in the first place? One positive method of training your German Shepherd is one in which you teach your GSD to obey your commands by participating in fun and games that make following your instructions so much more enjoyable. When handled properly this type of learning is a very positive experience and one in which even the most boring of commands can be learned very efficiently and effectively. To keep your German Shepherd from getting bored, playing fun and games of any kind, whether it be while training or simple play, can be one of the best methods available to you. One great tip for you is that any play activity that your dog really likes (but one that you can control) can be used as a fantastic reward for good behavior. For example, a game of fetch can be a great reward for a good training session. This will make training much more rewarding and something that the German Shepherd can really get excited about. Try using a favorite game like tug of war or fetch to reward great dog training sessions such as recalls or long stays. It will make the dog training more fun, more rewarding for the pet and the training will "stick" with your dog much better. Fun and games is very important - to your German Shepherd Dog, as well as to you. It is very important to know that you must establish control of your German Shepherd in any and all situations - especially when he's very excited as in the height of fun and games. Many of the games described below can actually help effectively train your German Shepherd in many ways. This is another one of my German Shepherd's favorite games. Again, the secret to playing this game with your dog successfully is for you to control it. For this game, choose one particular toy that will be used as your tug toy. Never play tug of war with any other toy.Start this game by picking up the tug toy and encouraging your dog to pick it up too. Give a particular cue that this game has started. Tugging is an instinctive behavior for dogs so your German Shepherd Dog should catch on quickly. Tug a few times, then tell your dog to "drop it". This is the second most important part of this game. Without a good drop command you will not be able to stop the game cleanly. You could then reward your German Shepherd for dropping the toy with either a treat or another round of tug Hide and Go Seek This is a very effective way of teaching a GSD to come to you when called. When you are out of sight of your German Shepherd, call your dog to you. You can either use your normal "recall" command or just the dogs name. Be very excited when your GSD arrives.Gradually start making it much more difficult by "hiding" in other rooms, behind doors, furniture, etc. If your German Shepherd doesn't find you at first, call your dog again. This is also a great game for kids to play with their GSD's. Very important to note: don't let the kids encourage the German Shepherd to chase them while playing this game however. All German Shepherds can learn to enjoy this game with the proper motivation and training. Some dogs are natural born "fetchers" and can do this with little or no effort or dog training, other GSD's are not. Our dogs favorite toy to retrieve is the jolly ball. Note: an important part of the fetch game is an effective "drop it". Be sure to teach and practice "drop it" first otherwise your game of fetch can easily turn into a keep away match. If your GSD refuses to return the ball to you directly, drops it too far away from you, or just doesn't cooperate with you and keeps the toy all to himself, etc, then it is best to end the game early and try again later. The game of fetch can be easily be trained by rewarding your German Shepherd's interest in some toy you have chosen ahead of time, then approaching that toy, touching it, and then later mouthing it and picking it up. Clicker training is another alternative to use while training fetch or any other activity or behavior. More fun and games - Get a box or bucket and collect a number of toys and other dog-safe items. Scatter the toys in a small pile on the floor. Through shaping and teasing, try to get the dog to pick up the toys one at a time, and then place them in your hand. Be sure to reward each toy given you correctly with a food treat.Once the German Shepherd is correctly handing you the toys make the game harder and harder to put stuff in your hand. Each item retrieved is dumped into the toy bucket/ box. Over time make substitutions that make the items increasingly difficult for the dog to pick up and give to you. Some GSD's may take the leap and start putting things directly into the bucket themselves. Treasure Hunt Put your German Shepherd in a down-stay or sit-stay and place a treat (food or toys) well within sight. Return to your dog and release it from the down-stay or sit-stay. Encourage your GSD to go get the treat. You will then allow your GSD to eat the treat or play with the toy. Repeat this, varying where you put the treat.Later on, "hide" the treat where your German Shepherd can't see it, but she can see you putting it there (behind a piece of furniture, for example). Release your GSD, and let her get the treat (show her if necessary). Next, hide the treat in further away, then in another room, out of sight, and if she stays in her "stay" let her find it. You can increase the distance, difficulty, and even number of treats as your German Shepherd gets better at "staying". This is especially good for dogs that have begun to learn "stay" but are nervous about having their people go out of sight. 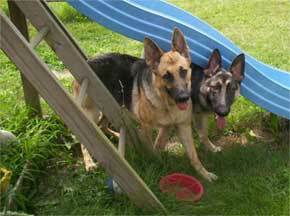 I put my German Shepherds in a down-stay and then I put treats all over in a variety of hiding places. They have to wait until I'm all done hiding them. When I say "GO!" the dogs then run around trying to each get the most treats before the other dogs eat them up. If your German Shepherd is a good swimmer, any activity mixed with water, say for example, at a lake or pond or even a small wading pool, can be so much more fun and fantastic exercise. My dogs love to play fetch in a small lake near our house not to mention playing in all the wading pools in our own yard. One of the best things you can do is to use any of the ideas above for fun and games with your dog or to use your imagination and to create new games of your own. Fun and games is just as important a part of dog training to your German Shepherd as it is to you. Below we will list links to some of the better writings we have found about dogs in general, and the German Shepherd in particular. Some are funny, some may be about fun and games, some are more poignant but all have one thing in common - they are all about our favorite animal, the dog.